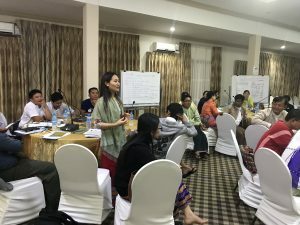 With the support and cooperation of Forest Department, UN-REDD PMU conducted a day workshop on consultation of proposed PAMs under the title of Incorporation of Vacant, Fallow and Virgin land into Permanent Forest Estate at Amara Hotel in Nay Pyi Taw. The workshop aimed for enhancing stakeholders’ engagement on proposed PAMs, developing proper definition of PFE in supportive way of REDD+ and generating recommendation for policy changes. At opening ceremony, Director General of Forest Department, Dr.Nyi Nyi Kyaw gave opening remark highlighting the government encouragement of public involvement in policy review and recommendations. After that, Mr.Tim Boyle, Chief Technical Advisor of UNREDD programme explained about workshop’s objectives, preliminary observations and general conclusions resulting from the consultations done by UNREDD programme. Over 60 participants from government agencies, non-government organizations, local organizations and ethnic organizations actively participated in the consultation workshop. Staff Officer, U Than Naing Win from Planning and Statistics Division of Forest Department presented the topic of reviewing PFE policy target and relevance to the current political and socio-economic circumstances of Myanmar. In addition, U Myo Ko Ko, Project Manager of Point organization discussed about CSO perspective on PFE targets. And U Aung Myat kyaw, Deputy Director of Planning and Statistics Division gave explanations of procedures for incorporative land into PFE and provisions for respect of local communities’ rights and status of traditional-managed land in relation to the PFE. Ms.Mai Thin Yumon from Chin Human Right Organization and Ms. Naw Pasaw Phaw from Conservation Alliance Tanawtharyi discussed about community concerns and their regional issues related to PFE. After the series of presentations and discussions, participants actively discussed in groups and gave recommendations and feedbacks for policy changes.